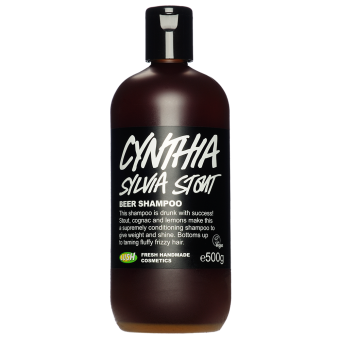 today I'm going to review and share my opinion on Cynthia Sylvia stout beer shampoo by Lush. The first time I saw this shampoo in Lush I bought a small version just because the whole idea of a beer shampoo sounded fun. Three bottles later and I'm still hooked. Sad but true my local lush store cancelled this shampoo so I have to order it online from now on. Also a fun fact cognac is another ingredient in this shampoo besides beer. Cognac oil is used to give your hair a nice smell. The Stout beer is a dark beer and dark beers are mostly used to give the hair volume, softness and shine. It's been used for centuries on dry and lifeless hair to give it back life. Lemon juice are good for their antibiotic and antioxidant properties cleanse and brighten, removing dirt and making your face feel matte. As lemons are astringent, their acidity also causes the hair follicles to lie flat, meaning your locks reflect more light and look shiny. I started to use the shampoo because the whole beer shampoo sounded fun and I love beer. For a very long time I used Big from Lush because it gives your hair volume. Somehow I wasn't fully satisfied with Big. When I started to use Cynthia Sylvia stout beer shampoo I knew why. My hair has a lot of volume by itself which the beer shampoo brought out instead of give it. It also tamed my fuzzy hair during the colder months. My hair got healthier, thicker and longer than before with the nicest shine ever. I'm so in love with this product even after more than a year of using this product. For those wondering if it smells like beer, I have to answer with a not really just a little bit. It mostly smells like most Lush products with a hint of dark beer.